We’ve been tracking FNHI very closely, and it seems each time we update our readers on its performance, it has gone on to set new highs. Yesterday’s session was no exception, as the stock once again hit a new upper limit, and extended our already impressive witnessed range even further. We also mentioned that it had closed with strength on Friday, holding most of its daily advance into the close, so we’d want to watch for a continuation of the trend and that’s just what we got. The stock touched a low of .0359 in the morning before making a steady bullish push throughout the day and hitting a new high of .0574. That worked out to an intraday move of 60% and extended our total witnessed range on the stock to an enormous 841% in a matter of roughly three weeks! We included USRM in our report yesterday for the first time in several months, and caught it just in the nick of time to have a chance at a very nice intraday gain. The stock performed exceedingly well, running from an early low of .014, and spending essentially the entire session pressing northward, as it reached .0241 for a daily pop of 72% and closed with a lot of strength at .024, just a tick below the high-of-day. Volume was strong as well, with more than quadruple the 30-day average number of shares changing hands, so we’re definitely going to leave an eye peeled for USRM moving forward. Lastly- Despite tanking into the close, IBRC was another stock we were watching yesterday to make a solid move. That move came in the first half of the session where it rose from its morning low of .0036 and reached as high as .0063 around 11:30am. That represented an intraday upswing of 75% The stock did of course fall off into the close, but that doesn’t mean we’re not still paying attention. The kind of volatility we’re seeing in IBRC can really be leveraged to our advantage with properly timed swing trades that could be up for grabs once the stock finds and bounces off of a solid support level. On Friday morning, we were giving our readers an update on the stellar performance of FNHI since we’d first called it back on the 8th. subsequent to which time, the stock was trading at a low of .0061. Not only did FNHI follow it up with a solid intraday pop, but also extended our total observed range in just over three weeks by a significant margin. The stock also closed with strength at .0421, holding most of its daily advance, so we’ll be watching it this morning as we prepare to kick off a new trading week. Speaking of big movers, our tag of CNXS in Friday’s report came just in the nick of time for us to catch a fantastic intraday performance. The stock traded up from a low of .0051, cracked through the penny barrier, and reached as high as .0159, for a whopping run of 212% on the day! That performance marked the third straight session of higher highs and higher lows, so we’re definitely going to be on the lookout for a possible continuation of that trend. Ideally, we’d like to see CNXS hold support at or above Thursday’s swing high of .0092 on any pullbacks. We also need to bring readers up to speed on the excellent post-earnings options idea we formulated on Friday for Foot Locker, the FL 03/17 $70-75 Calls. Prior to last week, the all time high for Bitcoin was $1160, last week that high was broken, and has been making higher highs since. It’s about time that we came back to rehash one of our top performing stocks of the month in FNHI this morning. We’ve been continuously monitoring this play all February, since our initial alert which came on the 8th, subsequent to which we would observe a low of .0061 in the stock. We continued to follow up on this play, including reminders in last Friday’s report, and on Tuesday as well. It’s been quite a ride since then, as FNHI has gone on to barrel into Pennyland, and eventually break both the two and three cent marks. Yesterday the stock reached an impressive new high of .0357, which represents an overall upswing of 485% in just a shade over two weeks! Big congratulations go out to anyone who got involved and reaped some serious rewards off of this fantastic subpenny-to-penny mover! We spotted a potential recovery play in NAK, which has gotten beaten up in recent sessions, but is exhibiting the traits of a stock that could be headed back up in sessions to come. 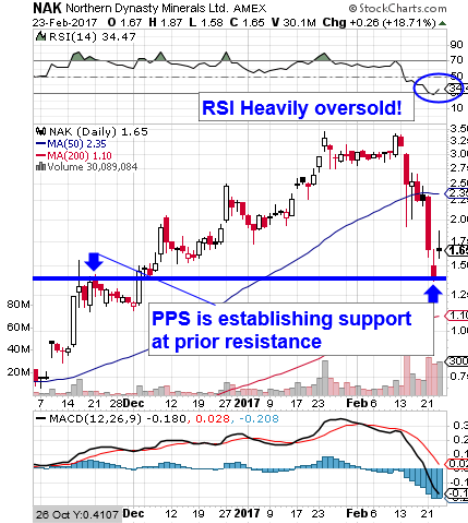 Whenever we see a bottom-bouncing stock which has established support at a previous resistance level, especially one this oversold, we’re always on the lookout for the possibility of a rebound. We’re going to keep NAK on our radars indefinitely, as we feel that a significant push back to the upside could be just a matter of time. Foot Locker, Inc. FL – For a quick options trading idea this morning, we’re going to signal a range of longer-term contracts in the Foot Locker chain. Our targets, the FL 03/17 $70-75 Calls will have plenty of time to see the type of activity we’re looking for, with exactly three weeks until expiration. We tagged CETX as a bottom play in yesterday’s report, and we just wanted to update readers on its healthy performance. The stock traded up from a daily low of 3.51 to 4.43, a gain of 26% which is a good start to the recovery we were hoping to see. We’ll continue to have our eyes on this one, as a return to 5, 6, or perhaps even 7 dollars is not out of the realm of possibility in weeks to come. 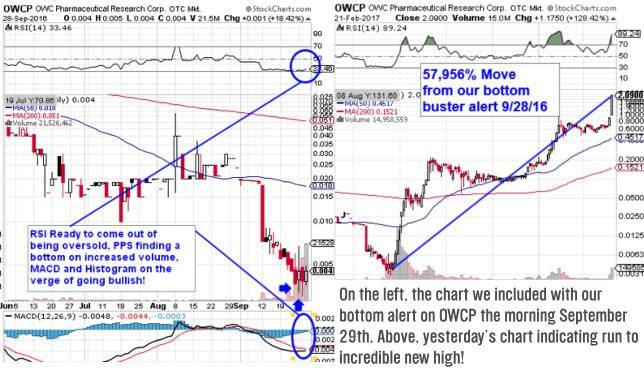 Our readers might have had to do a double-take when we reported our observed range on OWCP leading into yesterday’s session, which was a record-setting 57,956% from the low we saw subsequent to alerting the stock in our premarket report from September 29th (.0036). Sure enough, the stock once again set new highs, trading in a daily range from 2.16 to 3.23 on monstrous volume; good for intraday gains of up to 50% But hold onto your hats, folks, because that new high tabulates to an overall increase of 89,622% in the span of less than four months! It’s the largest gain of any pick we’ve ever issued, and may hold that record for quite some time, so we just have to give ourselves a huge pat on the back! As to anyone who was along for this ride that had the potential to spawn new millionaires, we salute you as well! In terms of alerts that originated in 2017, VDRM is one of our top performers. The stock traded with some excellent price action and volatility yesterday after we included it in our morning report. There was an early run from .0375 to .065, which works out to an intraday pop of 73% and that was followed by a dip-and-rip from .0376 to a strong close at .0625 (+66%). Far more impressive is the total amount of ground VDRM has covered since our alert on the stock from January 13th, at which time it was trading at a low of .0048. While it’s peanuts compared to the previously mentioned play, in and of itself, a gain of 1254% in less than six weeks is definitely something special!